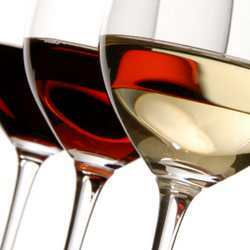 Explaining everything about French wine, Champagne and liqueurs on one little webpage would be impossible. Actually you could not even begin to do it in a book. The very best way to begin learning about this fascinating and tasty subject is to buy a few bottles and start tasting. However, it does help to have a few basic ideas before getting started. Any time you add knowledge to your experience, you greatly enhance your appreciation and awareness of the experience. This is particularly true with French wine, champagne and food. French wine is produced and bottled with consideration for where the grapes were grown. The concept of terroir, which is based on geographical position, is an essential consideration in the making of wine in France. French wine labels will note where the wine was grown rather than the particular types of grapes that were used in its elaboration. This is quite different from other places in the world. So to understand French wine you must begin by understanding a little of French geography. France can be divided into 11 distinct wine regions: Champagne, Alsace, Bourgogne, Loire, Jura, Bordeaux, Rhone-Alpes, Sud Oeust, Langedoc-Roussillon, Provence and Corse. In a very general sort of way, wines that are from the more northern regions are white and dry and the wines from the more southern regions are red and full bodied. There are, of course, lots of exceptions. Learn more about French Wine Regions. So great, you say, all I need to do is look on the label and see which region it is from. Ah, but that would be too simple. Instead each region is further divided up into lots of tiny regions and each of these is what goes on the label, generally with no mention of the larger region. Alsace wine, which is classified by type of grape, is an exception to this way of labeling. Learn more about French Wine Labels. It can be a very fun game to learn where the sub wine region is. Once you learn a sub region, you are not likely to forget it. For example, you enjoy a couple different bottles of Sauternes wine, and forever after you have a good idea what that sort of French wine tastes like. There are of course good bottles and not so good bottles, but they will all be similar in nature. 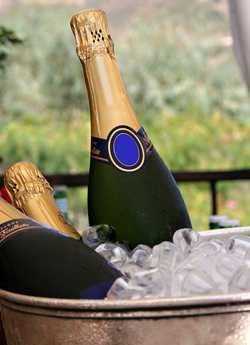 Champagne is a special kind of French wine that undergoes a second fermentation once it has been put in the bottle. Carbon dioxide is released during this fermentation and because the gas can not escape it enters into the wine and makes tiny bubbles. It is only very specific grapes grown in a very specific area in France and made into wine in a very specific fashion that can legally label itself Champagne. French wine makers would like the rest of the world to respect the Champagne label, but this is not always the case. In France, Champagne is typically drunk to mark special occasions and might make an appearance at cocktail hour (l'apéritif) or after dinner, just following dessert. A special occasion need not be a huge event, a birthday, a raise in salary, or the arrival of friends are important enough reasons to get down the flutes. The grapes used to make Champagne wine are Pinot Noir, Pinot Meunier and Chardonnay. These grapes do not fully ripen in the harsher northern climate of this part of France. For a long time the wine made in this region was not too good - you need a minimal amount of sugar to a get a decent wine. Champagne history tells us that it was in the 18th century that wine makers fully developed the technique of adding a bit of sugar to the bottle before sealing it. This made up for the lack of sugar from the grapes, but it also encouraged a second fermentation and gave Champagne all of its fizzy goodness. Extra Brut - No added sugar, resulting in a very dry wine. Brut - A very small amount of sugar is added, giving a wine just a little less dry than the extra brut. Extra Sec - Sec means dry. A little sweeter than brut, but still would be considered by most to be dry. Sec - Here we enter into the territory where most people enjoy their wine. This is dry, but within reason. Demi-Sec - A balance between dry and sweet, that many find to be the most pleasing. Doux - Doux means sweet. This is a notably sweet wine. One fun thing about Champagne is that it does not come in just one boring size. Many people think that a magnum, which is two times the size of the typical wine bottle, is the very best way to bottle bubbly wine. But there are many other Champagne bottle sizes. French liqueurs are truly glorious in flavor, history and even mystique. Many of these liqueurs are known the world over: Grande Marnier, Chartreuse, Benedectine, crème de cassis , Chambord , and others. In France these are typically enjoyed in small quantities after dinner when a little sweet something might be appreciated. They are also used frequently in recipes to add flavor, punch and sweetness. The makers of these liqueurs like to market their products with all sorts of horrific sounding cocktails. However, if it is a quality product, it is probably best enjoyed in a more simple fashion. Considerable care goes into making a quality liqueur. Only the best fruits and other ingredients are used. Always look at the label when spending money on a liqueur - many of them are mostly sugar syrup and alcohol, with only fruit flavoring. Look for real fruit - not flavoring. In some cases it should be the first ingredient. Learn more about French liqueurs. Learn more about French brandy. Return to Easy French Food homepage.